A 1958 Ferrari 250 GT Berlinetta Competizione ‘Tour de France’ sold for £4,760,000 as the top result at the 2015 RM Sotheby’s London classic car auction. Four cars sold for over a million dollars at the London sale: 1958 Ferrari 250 GT Berlinetta Competizione ‘Tour de France’ for $7,392,520, a 1964 Ferrari 250 GT/L Berlinetta for $1,910,300, a 1992 Ferrari F40 for $1,313,260 and a 1965 Aston Martin DB5 Vantage for $1,217,600. 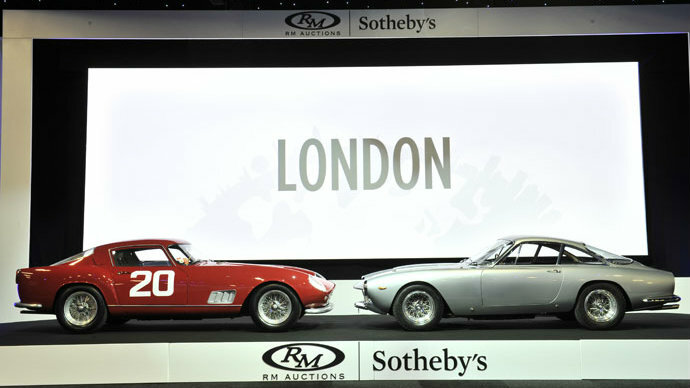 RM Sotheby’s London classic car auction took place on September 7, 2015, in London’s Battersea Park. The auction generated £16,658,410 ($25,404,075) with a slightly disappointing sell-through rate of 74%. The top result at the 2015 RM Sotheby’s London sale was for a 1958 Ferrari 250 GT Berlinetta Competizione ‘Tour de France’ that achieved a strong £4,760,000 ($7,392,520). This is the highest price paid thus far in 2015 for a car sold at public auction in Britain and amongst the top-20 highest prices paid for any car sold at classic car auction in 2015. This car with coachwork by Scaglietti is a very early LWB version with a single louver between the rear and side windows and covered headlamps. It is one of the ultimate dual-purpose alloy competition Ferraris and even had its original engine recently rebuilt and refitted. The second highest result of the auction was £1,232,000 ($1,910,300) for a 1964 Ferrari 250 GT/L Berlinetta ‘Lusso’ by Scaglietti. In contrast to the Tour de France racing Ferrari, this car is clearly more intended for comfortable and luxury road use as the Lusso (luxury) indicates. The car on offer is finished in it original color combination of grigio argento over nero leather interior with its original engine rebuilt in 2009. It was the 338th of 350 examples built. Despite being the most common Ferrari, F40s in good condition have achieved in excess of a million dollars at most auction in recent months. The 1992 Ferrari F40 sold for £845,600 ($1,313,259) at the 2015 RM Sotheby’s London classic car sale. This late production model with adjustable suspension and catalytic converter came from single ownership and has covered only 4,000 km since new. The only car other than Ferraris achieving over a million dollar at the London auction was a 1965 Aston Martin DB5 Vantage selling for £784,000 ($1,217,590). This car is one of only around 40 right-hand-drive factory Vantage saloons ever built. It comes with its original matching numbers engine and is fully restored. Aston Martins have achieved good results at many auctions in 2015 and more cars are likely to come to market as owners try to challenge the million-dollar mark. The 1995 Bugatti EB110 Super Sport sold for just shy of a million dollars. This is a rare car – only 33 were built – but from a period in Bugatti’s history not celebrated by all fans of the marque. Another car worthy of mention was the 1964 Maserati Mistral 3.7 Spyder. The 1964 Earls Court Motor Show car was sold new to British screen icon, Diana Dors, who had fallen in love with it whilst visiting the motor show. As one of only 20 right-hand-drive Spyders built, the Mistral is extremely rare and was presented in fully restored condition. It sold for £526,400 – a world record for a Maserati Mistral sold at auction. RM Sotheby’s next major auction will be at Hershey, Pennsylvania, on October 8-9 while the New York auction on December 10, 2015, is also likely to present some interesting cars and top results.